Nuestro Salvador, in Montevideo, Uruguay, is a witness of God’s love in an increasingly secular society. 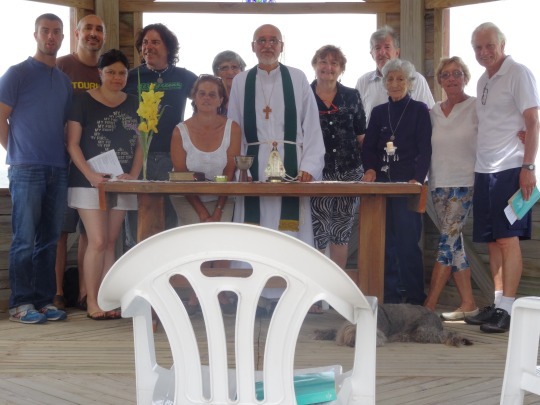 A group of four Good Shepherd travelers are spending some time with the Nuestro Salvador congregation in February 2016. We look forward to a renewal of our relationship as brothers and sisters in Christ. Get to know our Companeros in Christ! A record number of refugees and migrants from the Middle East and Africa are fleeing war and poverty and making a terrifying, life-threatening journey to find a safer, better way of life in Europe. Although they come from different countries, for various reasons, they share a common goal: hope for a brighter future. As conflicts continue, especially in Syria and Iraq, the number of people seeking safety and basic necessities is on the rise. Learn more about how we are called to respond. Through continuing scholarships and sponsorships, Good Shepherd participates in the global reach of God’s church and joins us with God’s people throughout the world. Good Shepherd has been in partnership with ministries of the Ethiopian Evangelical Church Mekane Yesus since 2005. We are family with the people of God in Ethiopia. Through our denomination, the Evangelical Lutheran Church in America we invite, reach out and walk together with other congregations, a multitude of national organizations and ministries, and our global partners. Learn more about the ELCA. Young Adults 18-29 interested in serving the world through a year long mission position through the ELCA. Learn more.